National Health Mission, J&K in collaboration with Jhpiego India launched 5-days training programme on Dakshata for improving Quality of Care in Labor Rooms. 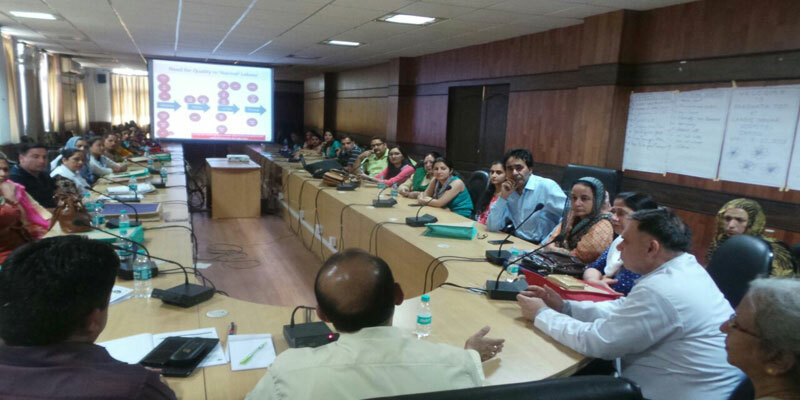 April 18, Jammu: National Health Mission, J&K in collaboration with Jhpiego India launched 5-days Training of Trainers programme on Dakshata at Conference Hall, Govt. Hospital Gandhi Nagar, Jammu today on 18th April, 2018. Dakshata is an initiative of Ministry of Health & Family Welfare, Govt. of India to improve quality of care in Labor Rooms of Hospitals. The objective of the five day training programme is to make Dakshata Trainers/ Mentors who shall impart further training to labour room staff working at delivery points of their respective district health institutions until all the delivery points are saturated with trained staff followed by continuous onsite mentoring & supportive supervision visits. 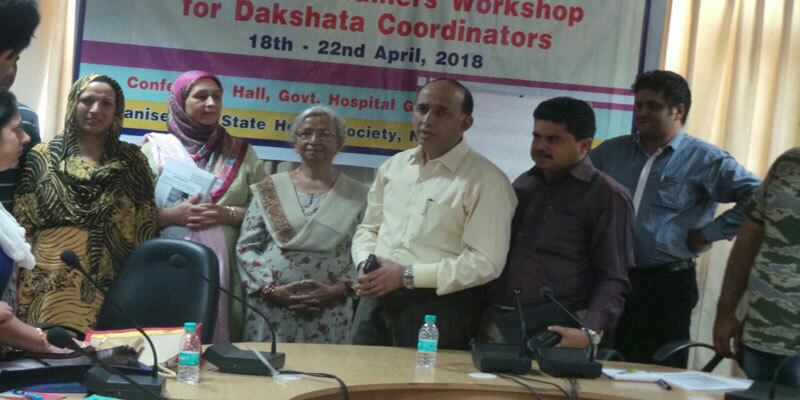 In the first phase, four participants which include Gynaecologist, Medical Officer, RMNCH+A Consultant and Staff Nurse, from each of the identified District namely Kathua/ Rajouri/ Poonch/ Reasi/ Doda & Kishtwar are being trained as Dakshta Mentors. In addition to that, two Staff Nurses each from District Hospital Udhampur and Govt. Hospital Gandhi Nagar Jammu are also being trained under the said programme. Under Dakshata, the focus is to improve the quality of maternal & new born care during the intra & immediate post-partum period by enhancing the competencies & skills of staff working in labour rooms and developing a system of post training follow up and mentoring; enhancing availability of essential commodities, supplies & equipments in labour rooms; and strengthening the capacity of the facilities and the system to measure the quality of care on a regular basis. The training was inaugurated jointly by Dr Yashpal Sharma , Mission Director NHM J&K & Dr Gurjeet Singh, Director Health Services, Jammu. While addressing the participants, Director Health Services, Jammu Dr Gurjeet Singh emphasised on the participants to take the training seriously & further train all the staff of the identified delivery points in order to improve the quality of health care in labour rooms for further decreasing the Infant Mortality Rate & Maternal Mortality Ratio of the State. 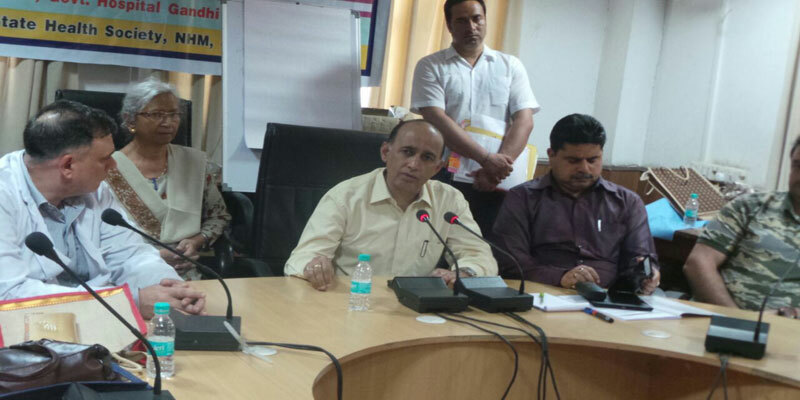 Mission Director NHM, J&K Dr. Yashpal Sharma in his inaugural speech encouraged the participants to translate the learned skills into practice and informed that similar trainings for Labour Room Staff at District level shall be started very soon. He also informed that similar training has been conducted in Kashmir Division in which participants from District Anantnag/ Pulwama/ Baramulla/ Kupwara & Ramban have been trained as Dakshata Mentors. Dr. Yashpal Sharma in his address also thanked the resource persons from Jhpiego, New Delhi for providing technical assistance in implementing the programme. The resource persons for the training from Jhpiego are Dr Rashmi Asif (Director Clinical Services & Training, Maternal & New Born Health, Jhpiego India) & Dr Apoorv Jain (Programme Officer, Jhpiego India) while as the training was coordinated by Dr. A.D. S. Manhas, Medical Superintendent Govt Hospital Gandhi Nagar, Jammu; Dr. Harjeet Rai, Divisional Nodal Officer NHM Jammu, Dr Arshad Nazir, Assistant Programme Manager, Maternal Health, Dr. Aadil Bashir Assistant Programme Manager, Trainings, State Health Society, NHM J&K.